lt;stronggt;RCP352000BGlt;/stronggt;lt;BR/gt;Rubbermaid Untouchable Waste Containerlt;BR/gt;When space is at a premium, here's a solution for waste disposal. Durable and crack-resistant construction. Optional lid RUB-362000BK sold separately. 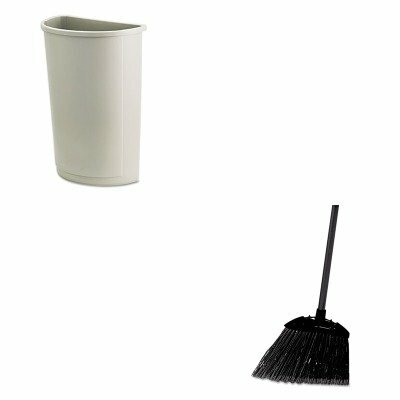 Waste Receptacle Type: Wastebaskets Materials: Plastic Application: General Waste Capacity Volume: 21 gal.lt;BR/gt;lt;BR/gt;lt;stronggt;RCP637400BLAlt;/stronggt;lt;BR/gt;Rubbermaid Untouchable Waste Containerlt;BR/gt;Cut and shaped for easy sweeping in hard-to-reach areas. Flagged, acid-resistant polypropylene fill bristles. Will not stain, discolor or absorb odors. Can be used wet or dry. Overall length 35amp;quot;. Application: Spot Bristle Material: Polypropylene.